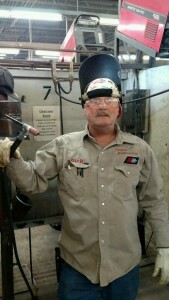 Rick Warnock has been teaching at the Tulsa Welding School for about six years. From the Kellyville, OK, area, Rick has travelled the country and the world as a welder. Welding has run in the Warnock family for generations, and the line continues as one of his sons, William, is also an instructor at TWS. When did you start welding Rick? I came through the Tulsa Welding School as a student in 1971, right out of high school, so it’s been a lifetime in the industry really. This is the second time I’ve taught at this campus. I taught here for a year or two back in the early 90s before I went back into the field. I always liked teaching, but at the time I felt I wasn’t ready to do it for the rest of my career. I was in my 30s and I still wanted to do more field work. Before I came back six years ago, I’d occasionally run into students that I’d taught back then. They’d tell me that I’d made a big difference to their careers and their lives. That made me think that I’d done some good while I was there, which I hadn’t thought about before. So I decided that it might be a good way to close my career and pass my knowledge on to others. It’s paying off for them as well as it did for me, and that’s full circle. Were you working in the field in Oklahoma? I’ve worked all over the United States and overseas. I worked shutdowns in nuclear power and chemical plants on the west coast and the south coast. I’ve worked in Australia and in British Columbia, Canada. It’s been a pretty good experience. This career has taken me around the world. I always tried to enjoy the places and countries I went to, and the people I met. Pretty much what I’m doing now. Welding runs deep in my family. I had an uncle that was a welder and both my grandpas, my other uncles, and my dad were pipefitters. So I just carried on the family trade you could say. I’m not really a movie guy but I like country and western music; that’s pretty much all I listen to. I prefer the older guys like Merle Haggard, Johnny Cash, and George Strait. I’m not a big reader either. I’ve got a Forbes magazine subscription. I read that because it has a lot of business stuff in there that interests me. Donald Trump. He’s been broke enough times, and he keeps coming back. He evidently knows something that I would like to know! So if I could pick his brain for a little while, I might start a different career! He would certainly be interesting to talk to. I’m widowed and I have two sons, William and Clinton. My younger son William is an instructor here at the school, and my eldest Clinton works at American Airlines. I went to Hawaii last May, so I’d go back to Honolulu and spend a lot of time on the beach and a lot of time fishing! I prefer deep sea fishing to lake or river fishing. When I was younger, in my teens before I became a welder, I went down to Mexico with my dad and sister. We went fishing in the Gulf and caught a ton of fish. It was an absolutely fantastic day, I still remember it. There’s not much opportunity for deep sea fishing here in Oklahoma. But that’s in my plan when I retire in a few years. They have to be willing to commit and apply themselves 100%. There’s so much knowledge here, so many years of experience with all the instructors, that if you apply yourself and give it all you can, you can succeed through hard work. The bottom line is “the more you learn, the more you earn”. There’s no excuse for a person to leave here and not be ready. If you’re a little bit slow in picking stuff up, just put in more time and effort. If you’re a hard worker you can work through any obstacles and build your ability. I’ve had many guys like that go through here; they may not have had all the ability in the world, but they worked hard and are making good money today. It’s the actual welding itself because every weld, even if you’re doing a repetitious weld, is still a new weld. Everything may come out the same, but the process can vary greatly from one weld to the next. You never know for sure how it’s going to turn out until you get it done. That’s what always interested me. It’s like a new challenge every time, that’s what kept me welding. Obviously a Stinger is a big part of it. That’s where I’ve made my living with a Stinger and a TIG torch. You’ve got to be versatile; you can’t just stick with one thing throughout your career. There are several forms of welding, and you need to learn as many of them as possible. I would say my instructor when I came through this school Jerry Griggs. He was also the Director of Training when I first came here to teach. He’s the one who called me to see what I was doing. He’s retired now. If it wasn’t for Jerry I wouldn’t have become as good a welder as I was when I left here… that’s for sure. I would probably head up to Keystone Lake about 20 minutes from here, sit below the dam and watch the water run to tell you the truth. Maybe take a little picnic lunch, enjoy the peace and the fresh air. If I had more time, then I might go hunting… I like to do that too. What kind of question is that? I would just travel. There’s a lot of places I’ve worked that I plan on going back to on vacation some day, so I guess any power that could get me around the world quicker would work!